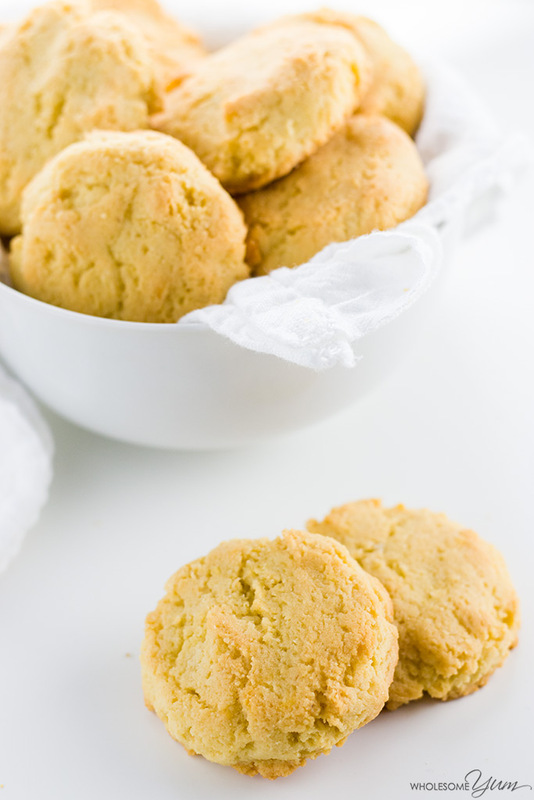 This paleo almond flour biscuits recipe needs just 4 common ingredients & 10 minutes prep. These buttery delicious low carb biscuits will become your favorite! Who else does meal prep on Sundays? I can’t be the only one! And, low carb almond flour biscuits make a regular appearance in my prep. More of you are looking at recipes here at Wholesome Yum on Sunday than any other day of the week. Clearly, many of you were crazy busy in the kitchen yesterday. I have to say I totally agree with you – Sunday is the best day to cook for the week ahead. Since these paleo biscuits with almond flour have been in my weekly rotation for the past month, I couldn’t wait any longer to share them! Sunday meal prep has become a comforting routine for me. My family doesn’t usually have concrete plans in the morning that day, so I ask my daughter if she wants to cook with me. She squeals in delight every time! She loves sitting on the kitchen counter as I do my cooking. I let her turn over measuring cups into a bowl or stir using a big spoon. Cooking is so sweet with your kids! As cliche as it sounds, it feels like she’s growing up too fast. The time we spend together in the kitchen is just priceless. It feels like moments frozen in time. Plus, weekdays get so busy for many of us. Having some aspects of meals ready to go in advance is a huge time saver and makes for easy weeknight meals that are still healthy. After I made these almond flour biscuits for the first time, I wished I’d done it sooner. Not only were they deliciously buttery and satisfying, but having them on hand all week was so convenient! I brought them to work, served them with dinner, and even incorporated them into snacks. What would you use them for this week? Almond flour biscuits are surprisingly easy to make. And this particular recipe is super versatile! These keto biscuits come together with only 5 ingredients that you most likely already have on hand. Plus you can make them in less than half an hour and have them ready to eat with your next meal! If you want to make this into strictly paleo biscuits or need to be dairy-free, you can use coconut oil or ghee instead of the butter. You can’t swap out the almond flour for coconut flour, though, as it would be way too dry. If you think of these paleo biscuits as a starting point, the sky is the limit. Really, you can get super creative with adding spices to the batter before baking. Add some rosemary and garlic to them for a nice savory roll to serve with a salad and filet mignon. Mmm. Add a sprinkle of parmesan and some Italian seasoning to this low carb biscuit recipe and serve them on the side with your keto chicken parmesan. Add in some smoked paprika, cayenne pepper, and maybe a little bit of shredded cheddar to your almond flour biscuits to make the perfect accompaniment to an low carb salad. 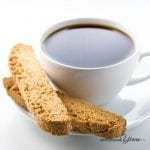 Want paleo biscuits for breakfast with your morning coffee? Top them with butter and drizzle a bit of low carb maple syrup on top. Soooo good! These are all savory versions, but I’ll bet you can go sweet, too! 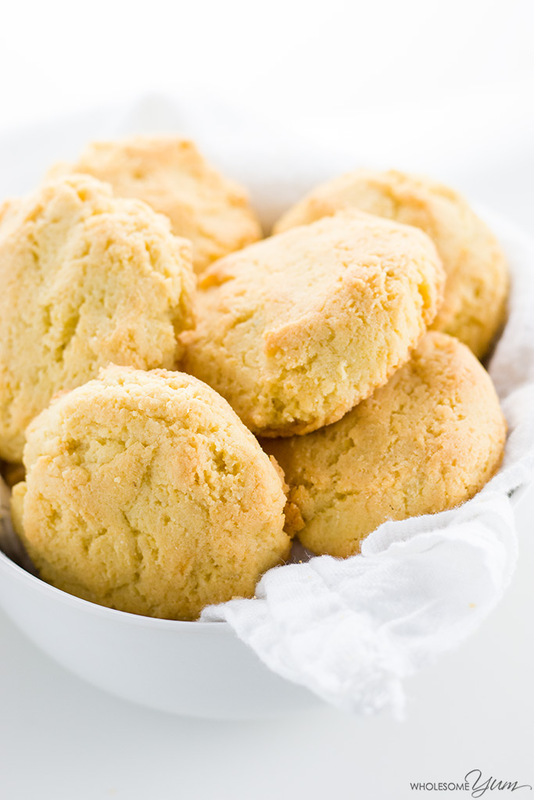 These almond flour biscuits are super easy to make. All you do is combine your dry ingredients and then add in your beaten egg and melted butter, stirring to mix well. That’s it! Then, scoop the dough onto a parchment paper lined baking sheet. Pro tip: Use a large cookie scoop like this one for uniformly sized biscuits that will cook evenly. So, so easy! It’s one of the reasons I keep making these low carb biscuits with almond flour again and again. The hardest part of the entire recipe is deciding if you want to make them plain or add some spices to them. Well, that and waiting the 15 minutes for them to finish baking (there’s that patience part of the recipe coming in again!). To get the best texture, you need to use the right almond flour. You’re not going to want to buy almond meal for this recipe, but instead a finely ground, blanched almond flour. If you forget to pack that cookie scoop well, your dough will crumble as you release it onto the parchment paper. And then you’ll have crumbs instead of a perfect batch of savory paleo biscuits. Unlike those made with wheat flour, low carb biscuits with almond flour don’t spread or rise much. Because of that, an inch is totally enough space to leave between scoops of dough. I actually have two ways of making these paleo almond flour biscuits. The ingredients and method are the same both ways, but I make them in two different shapes – biscuits as shown, and also a larger, flatter version. The biscuit shape is perfect to have as a side with soup, salad, or any entree or side dish. Or you can use the larger, flatter version of these almond flour biscuits as a bun or low carb bread. Just because you’re eating well doesn’t mean you have to give up burgers on buns or sandwiches on bread! This gluten-free biscuit recipe is fabulous to use for buns when you get to craving a BLT or thick, juicy burger. You may need to reduce the baking time by a couple of minutes for the flatter ones. Since they are not as thick, they cook a little faster. You can make these low carb biscuits with almond flour ahead of time, if you’d like. They’ll keep for a few days on the counter, or up to a week in the fridge. You can even make a bulk batch and freeze them if you’d like. Just take them out to thaw and reheat for use. You can warm them up in the microwave or oven right before serving. The only question is, what are you going to use these paleo biscuits with first? A burger? A roll on the side of your favorite low carb soup? Or perhaps to make a breakfast sandwich? Click or tap on the image below to play the video. It's the easiest way to learn how to make Paleo Almond Flour Biscuits! Today I made the almond flour biscuits. The recipe said it made 12 I only got ten. Ran the recipe through Carb Manager it came up 7 carbs for 10 it had 5 carbs for 12. The recipe has that they are 2 carbs! They are delicious but way off on the carbs. Why please is that? Thank you so very much! Hi Roberta, The difference is likely some rounding difference in a certain ingredient, most commonly almond flour. I cannot vouch for or troubleshoot 3rd party apps, but can confirm that the nutrition info on the recipe card is correct – it comes from the USDA Food Database. These were very easy to make and they came together easily. I didn’t have any issues. It gave me 7 nice size biscuits. My only question would be how to make them sweet? I thought the biscuit itself had a sour twang to it. Would still make again, but would prefer sweet. Hi Melanie, The size will depend on how big you make them. They shouldn’t be sour at all. Did you by chance use baking soda instead of baking powder? That could be it. If you wanted sweet ones you could use my almond flour cookie recipe and form them into biscuits instead of flat cookies. Ummm…I can. not. stop. eating these biscuits! AND, my picky boyfriend who does not like gluten or dairy-free baked goods, LOVED THEM. I used Miyokos butter if anyone is interested. I also did not have any issues with the dough holding together, it worked just fine. Thank you so much for this recipe, it could not have been easier or more delicious. These biscuits were very good. I enjoyed them. Hola!! Nos encantó la receta! Súper ricos!! Y bajos en carbohidrato!! Thank you, Diane! Erythritol is a sweetener, are you thinking xanthan gum? If so, yes, you can add about 1/4 tsp or 1/2 tsp to the dry mixture if you want them to be more chewy or sturdy. I’m glad you like the recipes! 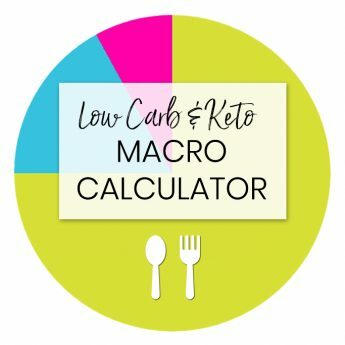 You can calculate your macros using the keto macro calculator here. 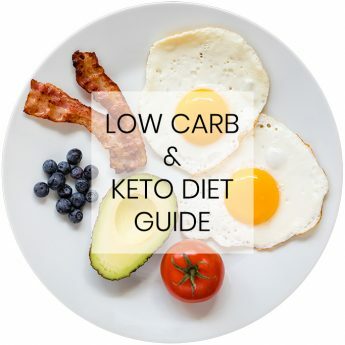 In general carb limits are about the same for men and women, though overall macros can vary, and the amount of carbs that would keep you in ketosis and/or facilitate weight loss will vary from person to person (not necessarily due to gender, but other factors, such as insulin resistance). Just have one issue, they all have cracks at the top when they come out of the oven. Hi Gillian, I’m glad you like them. Totally normal for them to have cracks. Could I add Erythritol to make it with sweet favour? How much should I add? Hi Winky, You’d need other modifications to the recipe to make it sweet, because adding too much erythritol would make the dough too dry. I can’t say what ratio to use without testing. If you want to sweeten them, an easier option might be a super concentrated sweetener like pure stevia extract or pure monk fruit extract, because with those you’d only be adding a tiny amount and not affect the consistency. Can I use regular baking soda? No, you need baking powder. I added a 1/4 cup of buttermilk seemed to be a little more moist. Of course I use buttermilk a lot. Did you use buttermilk instead of the called for butter or in addition to? Is it possible to use this dough for dumplings i.e. chicken and dumplings? Every recipe that I have found for dumplings calls for tapioca starch, But I only want almond flour. Oh and I do love these biscuits. Hi Scott, No, not this recipe, they will fall apart. But I do have a low carb chicken and dumplings recipe here. Made this last night and they were amazing!!!! I added garlic powder, parm cheese, cheddar cheese, and italian seasoning…..and oh my Red Lobster goodness!! They tasted just like the Red Lobster biscuits!! My son could not stopping them! Making more tonight, thank you. I was so excited that I jumped to the recipe first. Oh, my! These Paleo Almond Flour biscuits are superb! They have a buttery taste and a flakey texture, and I feel good after eating them, as I can’t eat gluten! I just made these biscuits, I did use the almond meal from Trader Joe’s, I will try regular almond flour next time! Mine were way to salty though! Has anyone else said they were salty? Hi Cindy, It’s possible that your salt grains are a different size and thus that made them too salty, or your palate is just different from mine. Feel free to reduce salt next time if you’d like. We found them too salty too! Might be because we used salted butter (but ingredient list didn’t say otherwise so we went with salted) and added the amount indicated for salt. Next time I’ll just use less salt. They were delicious nonetheless! 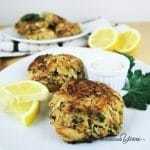 I made these with Parmesan and cheddar cheese several times! They are great! Thanks for the recipe! These were excellent. I was fully prepared for them to be dry and awful, but they were really really good. I would love a follow up recipe with different flavors like garlic, jalapeno, cheese etc. I’m new-ish to Keto. Quick question for you….everytime I do anything with my Organic Almond flour it ends up being super high in calories – like this one when I re-calculated with my own ingredients. Are there different types of Almond flour that I am missing out on that are way lower in carbs? For example, for only 1 tablespoon mine says that’s 3 carbs! Hi Kendra, Almond flour should not have 3 carbs per tablespoon. Are there other ingredients in the one you use? The one I use is linked on the recipe card above. I made this biscuit recipe and I loved it. First time trying almond flour. I plan on making much more. Delicious!!! Thank you for this recipe and keep ’em coming. How much sodium are in a serving? Thank you! Hi Angela, Sorry, I don’t have the information but feel free to enter the ingredients you use into an online calculator. I don’t have any parchment paper! Can I cook them on a silicone muffin pan? Will they stick to the pan and if so, how can I keep them from sticking? Thank you in advance. Hi Lisa, Yes, you can do that! You could grease it just in case, but silicone usually doesn’t stick too much either. Thank you so much!! They’re in the oven right now! I just can’t wait to try them and also get my daughters opinion on these biscuits! I seriously feel like I just cheated on my Keto diet…. these are THAT good! Hot buttered biscuits with a tiny drizzle of sugar-free maple syrup…. It’s gonna be a great day. Thanks for sharing this fab recipe! Can’t wait to try it savory with cheddar and jalapenos. These are delicious! I wanted something to dip my egg! Needs no butter or anything! I was a skeptic because I thought I used these ingredients before for a biscuit before but I was wrong these are as good as you can get in a gluten-free version. Thanks for figuring this super easy/limited ingredient recipe out for us!! I’ve searched for a dairy free passable biscuit recipe my whole family will eat. Everyone agreed these were two thumbs up. Besides being yummy, being so fast to come together is a big bonus when you have hungry kids! Thank you. I used coconut oil, but next time I am going to try lard! This recipe looks great! Can’t wait to try them. I was thinking of adding some buttermilk powder to them. I’d like them to have that southern stye biscuit taste. Do you think this will be a good addition? Any thoughts? Thank you, Alesha! That sounds delicious! You might need to reduce the almond flour by the same amount as the buttermilk powder (not too much) so that the dough isn’t too dry to come together. I made this and they smoked up my kitchen. They weren’t burnt or even close. What did I do incorrect? Hi Anita, If they were not burnt, this sounds like an issue with your oven rather than the recipe. Sorry to hear that! Did you use MCT oil? I find that if I use MCT oil in anything it smokes up the whole oven. Easy, tasty, and versatile. Thanks for the great recipe. Wow, I’m usually a skeptic when it comes to making low carb recipes because I love carbs. These biscuits were amazing and so easy to make! I like mine more savory so I added parmesan cheese, white truffle paste and Trader Joe’s Umami seasoning. Holy moly, I can’t stop eating them! Hands down, the best low carb bread/biscuit recipe I’ve ever tried. Its so easy to make, and the texture is awesome, so buttery and crumbly! I used 1/2 regular butter and 1/2 garlic butter and the result is HEAVENLY. I whipped my egg whites first, gives a lighter bread, I think. I whip in the yolks, then the warm, but not melted butter. I added grated cheddar since you mentioned they could fall apart. Perfect accompaniment to our soup! It tastes like pure soda, although it cooked through. Hi Oxana, Did you use baking soda? This recipe uses baking powder, not baking soda, and they are not interchangeable. I made this mistake and I have no idea how! I was like wow what a horrible aftertaste what is that?!? LOL I will try again once I go back to the store. All the reviews are great, but so glad I saw this or never would have figured it out! Thanks for the recipe! But please stop calling ghee “dairy free.” It still comes from cow milk and still makes me just as sick. Calling ghee dairy free confuses people and results in some people accidentally consuming dairy. Hi Claudia, I hope you like the recipe. I listed both ghee and coconut oil as options for people who have dairy issues. On the recipe card, there isn’t space to write a lengthy explanation about ghee and dairy, and as stated in my site terms, ultimately it’s the responsibility of each person to know their own dietary needs. Many people who have issues with dairy are able to tolerate ghee, since most of the commonly problematic proteins are removed during the clarifying process. Of course this isn’t enough for everyone, and if it isn’t for you, coconut oil is also given as an option. I absolutely support doing what is best for you! I absolutely love these..added a sprinkling of Italian herb,parmesan and cayenne pepper on the too before baking oh and cheddar cheese in the mix. I love them,thank you so much..these will be my go to biscuits or scones as we call them. I just made these and they are really delicious. I found out two years ago that I have a gluten allergy and finally got around to baking a bread product that is GF. I had one with butter and jam – delicious. Because I wasn’t sure how they would turn out, I fixed half of the recipe and clicked on metric and weighed everything out. In the future I will experiment because I would like to add shredded cheddar cheese and perhaps finely chopped veggies, like spinach to add a variety to my weekly menu. This looks amazing and the possibilities are endless. I’m going to add some sweet corn extract and see if I can get something close to a corn muffin. Oh my goodness, absolutely fantastic!! I have been low carb for 3 1/2 years and have never found even a decent ” bread type” recipe. These are outstanding. Thanks for sharing this recipe!! I always follow the directions to a tee when I try a new recipe and I wouldn’t change a thing about these. They turned out awesome. I’d eat this even if I wasn’t a diabetic. These were delicious! I cooked them for a little longer than called for and they turned out amazing. Thank you for sharing! I made the biscuits the came out good. I just don’t like the almond taste. These are so good! We have a local gluten free biscuit place. Now I’ve gotten this craving for biscuits, and I was using a recipe that called for sour cream, but they were turning out just like baked dough. These are much more like regular biscuits. I did add a bit of tapioca flour, and next time I might add a bit of ground coconut, but the ground almonds work! I also added a small spoonful of honey and a pinch of salt. Thank you so much. I added 1 tbsp honey 1/2 cup dried cranberries, 1 tsp lemon zest 1 tsp orange zest 1/2 cup sliced almonds 2 tabs orange juice then make as per recipe. Absolutely amazing. I just made these and they turned out extremely dry. I even had my spouse read the recipe to make sure I didnt miss anything. I ended up adding an extra egg, another 1/4cup of butter and 3tbsp of water. They baked nice and stayed together good but they tasted really dry & crumbly. Any suggestions? Hi Jodie, They shouldn’t be dry, did you use the same ingredients? Did you check the video to see what part went differently? I was skeptical because I’m not a huge fan of almond flour, but these were AWESOME! I added 1/2 tsp of stevia and they taste just like Bisquick biscuits! Thank you for the recipe! Made these on the weekend as I am doing Keto. OMG! They are fantastic and super easy to make. Thanks so much for the fantastic recipe. Passed it along to a few people who are also doing Keto and they also agreed. Just like the real thing. Will be making a batch every Saturday. Excellent! and very easy to make. I put everything in the food processor. I used half almond flour half arrow root flour. I didn’t have gluten free baking powder so I added equal amount of baking soda. I used raw butter solid. Turned out great texture and flavor were great. Will be making more. Thanks! I’m trying to reply to Timothy, not sure if I clicked the right button, but do you find the solid butter gives a better texture, like when making a pie crust? Almost gave 4 stars bc of the overwhelming almond flavor but realized that’s exactly what this recipe is so in reality they came out perfect for almond flour biscuits. Really nice texture, might add some cheddar next time to cut the almond flavor. I used melted ghee instead of coconut oil! Can I use regular baking powder instead of gluten free? Hi Shawndra, Yes, any kind will work. Most are naturally gluten-free anyway but I mention it for those that need it. my husband and I have been doing keto for about six weeks. I am loving it. but today I really craved pasta or rice or some kind of comfort food. so I decided to make these biscuits. and wow! they really did the trick! my husband loved them. we each had two….splurged a bit. but I will be making these often. and I am anxious to try some of your other recipes. thank you!!! THESE ARE GREAT! You’re so awesome! Im going to experiment with this. I’M thinking jalapeno… any suggestions? They are so many options, Rich! I hope you like them! Almond flour is expensive. Can I substitute whole wheat? Hi Lynn, I haven’t tried these with wheat. I’m not sure if it would work, but they would no longer be low carb, gluten-free, or paleo. just tried your almond four biscuits. AMAZING! Can’t wait to play with added ingredients – maybe lemon, lemon zest and stevia for a sweet tea biscuit? These are delicious and so easy to make. Thanks for another great keto recipe! I am so happy you liked them, Deborah! Thank you! Can I add some erythritol to sweeten these without adding anything else as in liquid? Hi Jeanette, No, they would be too dry so you’d need to make other changes. You might like these shortbread cookies that have similar ingredients but are sweet. You must be using a SMALL icecream scoup. I only got 6 biscuits out of this. I actually use a large cookie scoop, Marilyn. I hope that helps! These are so yummy! Thanks Maya, keep them coming! Sorry to hear you had issues with it. I’m happy to help, but it’s hard to say what went wrong without more information. Did you watch the video? Did you use all the same ingredients? At what point did it start to look different? I halved it and it turned out perfectly. I used a smallish egg because I wanted a drier biscuit texture. Also with quick breads (biscuits, pancakes, muffins) you only want to stir about 20 times, perhaps even fewer. It’s okay if you still see some flour in the batter. If you overmix the batter gets too heavy. When using almond flour in recipes, I grind my own almonds in a coffee grinder (although I just killed mine and had to use the food processor this morning). I find storebought almond flour is ground too fine and if I grind it myself, it gives a better texture. Same with ground coconut vs. coconut flour. This is the PERFECT recipe!! Super easy, speedy quick, & amazingly versatile! I’ve made it with bacon grease and coconut oil when I was out of butter, and both turned out perfect! Throw in some savory seasonings, or make them with coconut oil & add a little stevia or monk fruit sweetener and a dash of vanilla, and then flatten them out and you have cookies! Thank you so much, Sarah! All of those versions sound delicious! My sister made them for me this morning. They were great and tasted great. My only issue was they were very crumbly. I couldn’t slice it open like a regular biscuit to fill with eggs and bacon or jam. Any suggestions on how to fix this problem? I’m glad you like them, Linda! You can try adding a little xanthan gum next time – about 1/4 to 1/2 tsp – if you want them to be more sturdy. 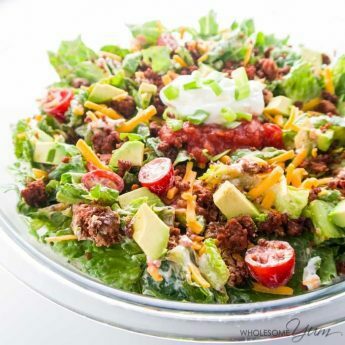 My sister & I are both keto and this recipe is a quick & easy STAPLE in our diets!!! We chat weekly about how we just prepped another batch in our kitchens. It goes with EVERYTHING! Thanks for throwing this recipe up there. Now if only there was a way to make butter biscuits using my big bag of coconut flour that’s sitting in my pantry haha…. that mystery is yet to be solved. I am so happy to hear that, Shaden! Have a great day! I have been utilising your recipes and they have change my husband’s and my lives! Thank you so much! Please keep the new recipes coming! I thought I’d share one of my favorite recipes I adapted using the Almond Flour Biscuit recipe to sub out the regular biscuits called for. I hope you try it – do die for!!! In medium cast iron frying pan, lightly brown sausage, onions and garlic; drain fat. Add tomatoes, mushrooms and seasonings. Bring mixture to a boil, stirring until slightly thickened. Drop dough onto hot mixture. Bake at 400 degrees for 10-15 minutes or until biscuits and cheese are lightly brown. Thanks for sharing, Cathy! That sounds amazing! Hi I’m trying so hard to find a good biscuit recipe and I did find this one and made some yesterday but I don’t have almond flour I used tapioca flour and they are hard and not very tasty. I found them bitter But I’m having a hard time finding almond flour. So is there away that I can make these with better luck with tapioca flour? I do also have arrowroot flour and brown rice flour, all of them gluten free. I’m really trying to find something that I can make a hamburger bun. I would love to have a hamburger. One of the only things I can have. Or would brown rice flour work and taste good?? Please if you can help me at all I sure would appreciate it. Any recipes I would appreciate I can’t have yeast or sugar and dairy I wish some one could come up with a substitute for cheese that tastes like cheese at least close to it. Hi Janet, Tapioca and almond flour are very, very different, so I would never recommend swapping one for the other. I wouldn’t expect this recipe to turn out well if using tapioca. What are your goals for these biscuits? Paleo, gluten-free, low carb, keto, or some combination of these? Arrowroot, tapioca and brown rice flour would all be unsuitable for low carb or keto, but are fine for gluten-free diets. Arrowroot and tapioca would also be paleo, but rice flour would not be. I haven’t tested this recipe with any of those flours, but I’m sure it would need other modifications to make it work. Sorry. I hope you’ll get the chance to try this recipe with the almond flour – I think it’s really delicious! I made these this morning they were gritty and bland and they were flat. I used the super fine flour. Is there something I need to do differently? Hi Lori, It’s hard to say what happened without being in the kitchen with you. They shouldn’t be gritty with finely ground almond flour. The one I used is linked on the recipe card. Did you check the video to see if yours went differently at some point? 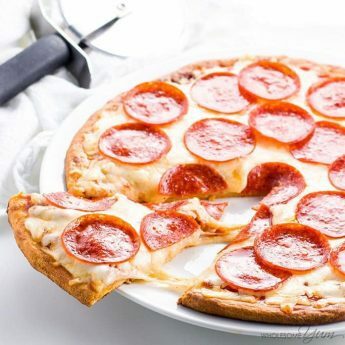 Hi, I have been looking for a recipe just like this where I can add a little cheese without the heavy cream or cream cheese other Keto recipes have. My question is, I do not have a cookie scoop. Suggestions on what to use instead? Maybe a 1/4 measuring cup? Thank you. Hi Michelle, You can just use a spoon and form the cookie dough into balls with your hands, then flatten with your palm. Hi Bentlei, The issue is that you used baking soda. It needs to be baking POWDER. Baking soda will definitely create that strange taste. Hope you’ll try them again with baking powder. I have a few questions for you. I’ll put them at the bottom. I’ve made these before, and they were delicious, but I was wondering if could make some changes. 1. Could I substitute a blend of nut flours that includes coconut? Would I need to add extra liquid to account for the coconut flour? Could I add a little more butter or a few tbsp of almond milk? 2. If I want to double these in size, say 2 tbsp instead of 1, how much longer would I need to bake them? Can I bake them without flattening them or do you think they will fall apart? 1. I don’t recommend substituting a blend containing coconut flour due to the absorbency, like you said. You can definitely try, but yes, you’d need extra wet ingredients to account for it. Without testing or knowing the ratio in the blend, it’s hard to know what else to add and how much. 2. I haven’t done the larger size, but you can definitely make them bigger and bake them for longer. You don’t have to flatten them, but the thicker they are, the longer they’ll take to bake through inside. If they start to brown on top before they are done inside, you’ll need to tent the top with foil to prevent burning (or use lower oven temperature to begin with, with longer baking time). Thanks for the reply. I found a conversion table. I might see what a difference subbing in a few tbsp of coconut flour might do to change the consistency. There’s probably a table for how much extra liquid it needs as well. Either way, I’ll probably still use this recipe. I had to put in some coconut oil last time when I ran out of butter, so I wonder if that changed anything. There are some conversions, but it’s almost always recipe specific and requires some experimentation. Hope you find a way that works for you! So, I thought I would update. I substituted 1/4 cup of coconut flour blended with arrowroot and an extra egg for the almond flour. It ended up being more moist, so I didn’t have to pack it together. I used all butter this time, and I made them bigger. I cooked them for 25 minutes and they turned out pretty moist. I think they expanded a bit, maybe because of the arrowroot. I didn’t notice much of a flavor difference. Thanks for the help. Do you have to use gluten free powder? Hi Beverly, Any kind of baking powder will work. Most are actually naturally gluten-free, but it’s not a requirement. I made these yesterday. They are great for me! I divided the batch in half and added cheese to one half and a very little bit of sweetener and cinnamon to the other. Both are so good. I’m so glad I found this. Recipies like this helps me keep the low carb lifestyle and the weight loss going. I am so happy that you liked them, Dawn! Have a great day! This was amazing! I just made these this afternoon when I got home. I halved the recipe and used a little less salt since I was not sure if I would use these biscuits for sweet or savory. I ended up trying one of the biscuits with the Pumpkin Butter from Trader Joe’s. SO GOOD! Thanks for the recipe! I am so happy that you liked the biscuits, Melanie! Have a great day! Keto biscuits are very good. I cut the recipe in half. I made exactly 6. Thank you so much. Is there a similar recipe to adjust this as an almond cookie? I’m glad you liked them, Veronica! 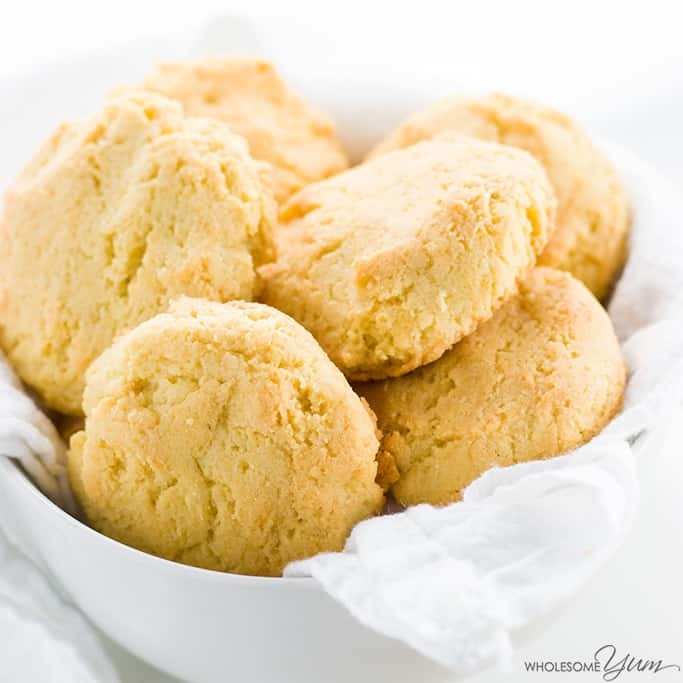 Yes – here is the recipe for almond flour cookies. Can we bake it like PITA bread, at least as flat? We sure appreciate the wealth of information. Being in the hospital 8 days, it was alarming to observe the spikes of my sugar. Just discovered you & hoping to follow you. Hi Amy, You can flatten them if you’d like, which I do sometimes for sandwiches. 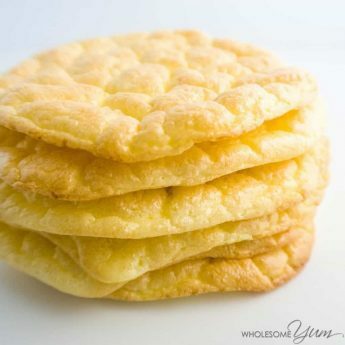 However, they are more like a buttery, crumbly biscuit texture than a chewy flatbread. Yes!! Finally a recipe that is 1) easy 2) doesn’t use five million ingredients and 3) is delicious!!! Thank you!!!! I am so happy you liked the biscuits, Mary! Have a great day! Could you I use these as dumplings or will they disintegrate? Hi Winta, Sorry, they will disintegrate. But, I have a dumplings recipe coming up this fall! Dumplings? Oh my, thank you! This recipe is amazing with duck eggs! Will there be a big difference if I used egg whites instead? Hi Christine, Yes, the texture will suffer. Egg whites alone without the yolk will likely make the result more dense and possibly rubbery. Would I be able to use regular baking powder in these (not gluten free)? Hi Allie, Yes, you can! Many baking powders are naturally gluten-free anyway, I just mention it just in case for those that have issues with gluten. Any kind works, though. I’m making these for our tailgate this weeeknd, however I only have kosher salt and Himalayan salt as well as regular table salt. Can I use any of these? Yes, you can use any of those, Kim. Thanks for stopping by! Wow! These are fantastic! They taste better than regular, unhealthy biscuits. These bread recipes are making my life so much better and easier being on Keto. I was going to put butter on them out of the oven, but I didn’t need to because they already tasted buttery. These will definitely be on my go to list for recipes. I plan on freezing some so they keep longer. You made my day, Aletheia! Please come back again soon! These were so good & easy & perfect! We’re starting low carb lifestyle, but not dairy free so I added a 1/4 cup shredded cheddar. First time using almond flour so the almond flavor was a little strong for the kids (but perfect for me!). I made 13 good sized biscuits (cutting the carbs down to 1.35 a biscuit per my brand choice and calculations) to pair with a no bean chilli (9g net carbs). Overall, dinner was a major hit tonight – thank you! I wasnt sure how I could pull off chili without cornbread in this household! I am so happy everyone liked the biscuits, Sarah! Thanks for stopping by! Please come back again soon! Can this dough be frozen before baking or put in the refrigerator? Hi Ginger, I haven’t tried freezing it. I wouldn’t recommend refrigerating because the baking powder reacts right away and they won’t rise at all if you bake them later. It’s better to just bake them and you can store them in the fridge or freezer, then reheat. Hi Stacey, They are definitely buttery biscuits. You might like one of my other low carb bread recipes better. I love to hear that, Leslley! Thanks for stopping by! The idea is great and technically the biscuits turned out fantastic! But I think it’s too much baking powder. Still I cannot eat it, it’s one of the worst experiences I ever had with something I cooked. It felt like brushing my teeth, it turned out bitter and my tongue got very irritated, it took about an hour to regain my senses. I have used organic baking soda and I have used it extensively until now, so the only problem I see is the quantity. Maybe the calculation in grams was not correct? I used grams. Hi Diana, The problem was the baking soda! It is NOT the same as baking powder. 🙂 Using baking soda would definitely make these taste bitter and just like you described. Hope you’ll try the recipe with baking powder next time! Can you use these biscuits in chicken and dumplings? Hi Kysha, I haven’t tried but I’m sure you can! Biscuits were good! I just started Keto a week ago, am loving how I feel so far. Less brain fog and after I got through the conversion to burning fat in the beginning, I have more energy!! I added shredded sharp cheddar and a little garlic powder in about half of these, those are good too. The recipe is a keeper. Thanks! I am so happy to hear that, Margie! Please come back again soon! Used paleo flour and added garlic and Italian seasoning and Parmesan cheese to have with spaghetti squash, such a basic biscuit with so many ways to change it up! Thank you! I am glad you liked them, Laura! Thanks for stopping by! These are absolutely fabulous. They are tender and versatile and a great alternative to traditional breads. I am so happy you liked the biscuits, Heidi! Have a great day! My husband and daughter LOVED this. Sadly, I did not. And I wanted to so much! Almond flour has a strong, distinct flavor (to me) and so that’s all I could taste. An almond flour-flavored biscuit. Still rated a 5 because they easily made 12 biscuits for me and the consistency was great. Will make again for family! Hi Linda, I’m glad your family liked them, and sorry to hear that you didn’t. Did you by chance use almond meal instead of finely ground, blanched almond flour? That is a lot more almond-y than the finely ground, blanched kind. Otherwise, hope you’ll find another recipe you like better! There are lots of other bread recipes in the recipe index. Baked this almond biscuits today. I added some cranberries and pumpkin seeds and they taste great! Thank your very much for the recipe. I love that you added cranberries and pumpkin seeds! These were incredible! much more successful than my attempts at the keto bread or bagels. nice breakfast on the go. thank you! I am so glad you liked the biscuits, Lynne! Thanks for stopping by! Haha I was looking for biscuit recipes, not til after they were cooked I remembered that biscuits in USA is not biscuits in the UK . I was looking for cookies but my husband is eating them anyway!! Hi Janet, Sorry about the confusion! I’m glad your husband still liked them. I do have lots of cookie recipes here. Delicious! I enjoyed one plain then spread a bit of strawberry jam on one for my husband and he loved it. He said they were good but a bit salty. Could I cut the salt done to 1/4 tsp and get the same consistency? Thank you! Thank you, Missy! I’m glad you and your husband liked them. The salt amount is for a savory/salty biscuit, so you can definitely reduce it if you want to have them with something sweet, like jam. The consistency won’t change if you reduce the salt, since it’s such a small amount compared to the rest of the ingredients to begin with. Why when I ask for low carb bread in a bread machine do you give me biscuits? Hi Dwayne, I’m not sure what you mean by “ask for”, but you can make this low carb bread in a bread machine. Hope you like it! Hi Kelli, It depends how big you make them but with the cookie scoop I got 12. I can only ever make about 6-8 biscuits with this recipe. The one time I made 8, they were tiny! They are delicious though! I love them! Hi Faye, The number of biscuits will depend on the size you make them. I’m glad you like them! I am so happy to hear that, Crystal! Is per serving 1 biscuit? Hi Mike, Yes, it is! Absolutely the BEST almond flour biscuit ANYWHERE!! You just made our low carb life DELICIOUS!! They go from biscuits to shortcake in a heartbeat! Has anyone had any luck with using any type of egg substitute? I seem to have light egg allergies so I’m trying to avoid eggs but I’ve used this recipe before and loved it with eggs. I would love to find a way to use this recipe with an egg substitute . Hi Shelly, I haven’t tried that yet. It might work with these. Please let me know how it goes if you try! I’m sorry but the biscuits tasted dry and insipid. Hi Rebecca, Sorry that they were not what you expected. It’s hard to say what went wrong without being in the kitchen with you or hearing specifics. Check the video on the recipe card – did one of your steps look different? This is also a “basic” recipe that can easily be modified to add herbs or spices for different flavors. Has anyone tried making these with avocado oil? Hi Shani, I have not but it would probably work. Has anyone made these into a sweeter version with stevia? Wondering whether to try it. Hi Jude, I have not. Let me know how it goes if you try. If you do, I’d recommend a concentrated stevia (not a stevia blend with filler), so that the consistency of the batter stays the same. In the nutritional information is says there is 1g of sugar, just curious, where are you getting that from? If this is correct, then I am not counting some sugar that I should be. Hi Joshua, Almonds do contain a tiny bit of natural sugar so it’s coming from that. Excellent! Definitely not light and fluffy like traditional biscuits, but very full of flavor. My main complaint is I want 2 or 3 which is not possible on my diet due to high fat content. I am happy you liked them, Stacia! Please come back soon! Hi ! Can I use a blend of flours? All I have is coconut and macadamia flour. Thanks! Hi Claudia, You can just use the macadamia flour instead of the almond flour. Don’t add any coconut flour, that would be too dry for this recipe. Hi Darleen, No, sorry. I’m working on a different recipe for coconut flour biscuits, so if you join the newsletter you’ll be notified once it’s ready! Hi Teresa, You are absolutely right. I offer both ghee and coconut oil as options depending on dietary needs. Some people who are lactose-intolerant are able to tolerate ghee since the milk proteins are removed. Others are not, and they can use coconut oil. Feel free to use what works for you! Hi Holly, My nutrition info comes straight from the USDA Food Database, which is more reliable than online calculators that can have submissions from anyone. It will vary a bit based on the brand you have, but not quite by that much. Most likely one of the ingredients had the incorrect amounts listed. You can check the nutrition info I use for individual ingredients in my low carb food list, which has data from the USDA. These biscuits are truly delicious. My family LOVE them. I make them with salted butter, so they are actually only 4 ingredients! I also experimented and added 1/2 cup grated old cheddar cheese to the batter. Oh my goodness, sooo yummy! Thank you so much for this life-changing recipe! I am so happy you loved them! Have a great day, Barbara! Thank you so much for this easy and delicious recipe!! You are so welcome, Toni! Have a great day! I am so happy you liked it, Sara! My biscuits did not rise. Looked more like a puffy cookie. I followed the directions. Hi there, Sorry they didn’t do what you expected! Low carb flours don’t rise as much as wheat does, these are more of a dense biscuit that rises just a little. If they were like a cookie, they were probably flattened too much to begin with. I hope you still liked the taste! Well…WOW!!!! The biggest challenge I have had woth reducing carbs and sugar in my house has been bread and cake. This recipie is super easy and turned out amazing!!!! You are my new guru!!! Thank you so much!!!! I am so happy to hear that, Natalie! Thanks for stopping by! These look awesome! But I am so confused; in the title, headline, and elsewhere you specifically state there are 4 ingredients, but there are 5 lol. Hi Lauren! Most people don’t count salt as an ingredient 🙂 I hope you like them! Thanks for stopping by! I made these for breakfast and they were great! I can’t wait to experiment with various add ins and spices. 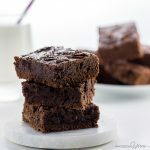 Made these in several varieties and they were all great! I’ve made them : as written, sub coconut oil for butter for a dairy free version, sub flax egg and coconut oil for a vegan version (my husband was SO happy for a keto-vegan biscuit!!). I’ve also done them with both almond flour and almond meal, and added cinnamon to partial batches of each kind for a no-sugar “sweet” treat. Thanks for such a versatile and delicious recipe! I am so happy you liked them and I love all of your varieties, Shae! These were so easy to make. Using a small cookie scoop I made them into small biscuits and they were a hit. I can’t wait to share this tasty recipe! Thank you so much. I am happy you liked them, Kat! I just made these and added a little garlic wow I’m really impressed these are awesome !!! Thanks for the recipe !! I am so happy you liked them, Becky! Hi Gloria, Yes, definitely! I do it all the time. How many biscuits does the recipe give? Hi Michelle! The recipe makes 12 biscuits. I hope you like them! What is the difference between almond flour and ground almonds? Hi Maureen, Almond flour is blanched and finely ground. It creates a better texture in baked goods. You can use either one in this recipe, but almond flour will yield a better result. Super easy to make! The video was helpful and it was well done. I subbed the coconut oil for the butter. Very tasty! All the ingredients were on my detox food list, so awesome bonus. Thank you so much, Elizabeth! I’m glad the video was helpful. Enjoy the biscuits! Super yummy and easy to bake. Ten points!! So, we tried this recipe. After following the instructions and quantities of the ingredients explicitly, the mixing bowl was not hardly damp and the mixed ingredients were still powdery with no chance of sticking together to make a biscuit. We added some water to help it stick together and the results were a “rubbery” biscuit after baking. Not in the least bit “buttery” as the recipe states. Any advice? Hi Jerry, Sorry you had issues with the recipe. One of the amounts or ingredients must have been different, because I’ve made these dozens of times and the dough is never powdery. I would double check the amounts and ingredients. Did you by chance use coconut flour instead of almond? That would definitely make them dry and not workable. I wouldn’t recommend adding water and can’t vouch for the results if adding that. Hello Maya! I made this recipe with an added cup of shredded mozzarella and I used a lit bit less of almond flour.They are delicious! Thank you for posting all your wonderful recipes! Hi Silvia, Thank you so much! The cheesy version sounds delicious. I’ve made this a few times. What I’ve learned is,they crumble very easily. I found a solution. I flatten them to use as a slice of bread. Cool off and store in fridge. The next day I fry in a pan of butter. It keeps them together and taste even better. I add garlic powder or other herbs to enhance the taste when I prepare them. So satisfying. Makes Keto diet easier. Hi Holly, Thank you for those tips! I like the flattened versions to use as bread, too. Hi Nancy, I’m not familiar with Lifesum, but I know they are on MFP. With most apps you can track macros for any recipe from the Internet. Hi, I’m on the keto diet, similar to Paleo. Can I just use regular baking powder instead of GF? Hi Diane, Yes, you can! Most baking powders are naturally gluten-free anyway, but some are not. If gluten-free doesn’t matter, any kind is fine. Hi Gigi, Yes, The nutrition info is per biscuit. They are very filling, too. I had a MAJOR blonde moment and forgot to add the eggs. This recipe actually has 5 ingredients, including the salt. Oops! I popped them in the oven and knew something was off. Oh well! I still used the crumbly “biscuit” as a crumb topping on my soup, but I can’t wait to make these (with egg) again! These are so good and easy!! I’ve added some cream cheese to the recipe a couple times which worked great. Have you tried to make these with coconut oil? It says it can be substituted for the butter. I tried tonight and the dough was so crumbly I couldn’t mash them together to make a ball. I added some water and that helped, and they tasted GREAT, but they were still dense and crumbly. Suggestions? Did I do something wrong? Hi Hillary, Yes, I have made them with coconut oil. Sorry you had trouble with it. It needs to be measured solid before melting, so maybe that was the issue? It’s fine to add a little bit more oil if you need to, but it’s normal for the dough to be fairly dry. They do come out dense like biscuits. Are you looking for a more fluffy bread? If so, this keto bread recipe might be better. These taste better than flour biscuits! Love em. I am very excited about trying this gluten free recipe. Is there any substitution for eggs that I can use? Hi Cheryl, I have not tested this recipe without eggs. You could try flax eggs, but I can’t vouch for the results. Let me know how it goes if you try that! I am trying to replace eggs with banana. I’ll let you know how it works! I made these last night and they are the bomb!! I added some dried garlic along with about 1.5 tbsp of herb de’provence seasoning. Delish!! Thanks for this easy delicious recipe! My husband and I love these biscuits. I added cheddar and Jack cheese. Yummy. I’m fairly new to paleo-low-carb-keto-type eating, and I’ve been craving bread and sweets with my meals. Tonight, I made these biscuits (my first almond flour venture!) and they filled that gap. Thanks for the awesome recipe! Can’t wait to try some more baking! I was just wondering how many biscuits this should make? Hi Hannah, this recipe should make 12 biscuits. Added some rosemary, and they were lovely! These are a fantastic canvas to add many different culinary ideas to. Great job! I mixed my ingredients in a mug with garlic powder and oregano, did it in the microwave like almost instant keto bread and they were wonderful. I love bread, its one of my weaknesses but these are my new healthy choice, I sliced my mini bread and put avocado and smoked salmon, delicious lunch. Next time capers are gong in the bread. Thank you, Sarah! That is such a great idea! Do you think these will freeze well? Going to try since I’m the only one im my house who is LC. Hi Cheryl, Yes, they do! I do it all the time. These were really tasty! Perfect for a paleo biscuits and gravy. I put them under the broiler at the end of baking just to brown the tops, and they looked perfect. Thanks! Thank you, Bethany! Biscuits and gravy sounds delicious! Hi – can this recipe be used for dumplings? Hi Angela, Unfortunately not, but now I added dumplings to my recipe to-do list! Good morning! I made these biscuits for breakfast and added 1 tsp of vanilla extract and 1 tbsp of swerve, to make them more compatible with coffee for my husband. I served them with butter while they were still warm. They turned out great! Thanks so much for your recipes and wholesomeyum.com! Thank you! I bet these sweetened were great with coffee! Maya, did you know the pecan pie bars recipe is linked to your biscuit recipe? I’m interested in the bars but the link sends me to the biscuits. Thanks. Sorry about that! You can find the pecan pie bars here. This recipe says it makes 12 biscuits. They are teeny tiny. It really makes about 8 normal sized biscuits. Hi Brooke, I didn’t think they were tiny – about 2 1/2 inches in diameter. But, you can make them any size you like! Hi Brooke, I agree they are a little crumbly. As pictured, I usually eat them plain alongside something, like soup or salad. If you want to make a sandwich, I would just make them flattened to begin with rather than trying to cut them in half. I do this a lot as well and use them for sandwiches that way. Otherwise the process would be the same, but if you flatten them you’d need to reduce the baking time by a few minutes. I think a couple tbls of ground chia seeds will stick this together quite nicely. I just made these for some biscuits and gravy and they’re a new favorite! So easy and quick to make, and a lovely flavor. I can’t wait to try the leftovers with some jam. Thank you, Madge! I’m glad you liked them! When I tried this recipe it left an intensely bitter, unpleasant aftertaste. The texture was great and the primary flavour was not bad either. Has anyone else had this experience? Any idea what the cause or solution might be? Hi Heather, I’ve never experienced this and have made them dozens of times. I suspect that one of your ingredients went bad – maybe the eggs or almond flour? Heather, I read on another site that the bitter taste might be from baking powder that has aluminium in it. Hope this helps! Your baking powder was probably not aluminum free… That has happened to me. I experienced the same horrible aftertaste. I threw the batch out. I looked at the recipe again, and realized I had used baking soda rather than baking powder! Yuk. I will try again. Thank you for sharing! Yes, the baking soda would definitely be the reason for the aftertaste. I’m glad you want to try again with baking powder! Just made a batch, very nice. Trying to find a gf biscuit for Thanksgiving. I think I found it. Made these and some bacon gravy this morning. I added 2 tbsp of sour cream and OMG! SO GOOD!! Thank you, Sara! That sounds delicious! Excellent! I added about a tbsp of applesauce unsweetened. These are amazing! I had been very ill with a stomach infection and haven’t been on solid food for weeks, so I had made an almond flatbread but it was extremely dry. Not being sure if these would be or not, I added the applesauce. I adore this recipe. So quick and easy with little baking time. Wow! Thank you for sharing! Thank you, Lulu! Hope you are feeling better! OMG, so good! I used Lawry’s Garlic Salt instead of sea salt, and added some cheddar cheese! They are just as good as Red Lobster’s Cheddar Biscuits. And like you said, so easy! Thanks so much for sharing this awesome recipe! Thank you, Cyndi! Love the idea of adding cheddar to them, yum! I can’t have almond. Do yo think sorghum flour would sub well? Hi April, I haven’t tried that. Let us know if it works! Yes, cashew flour should work the same way. But, it’s higher in carbs than almond flour. Macadamia nut flour is lower in carbs but also a little expensive. Thank you, Dawn! 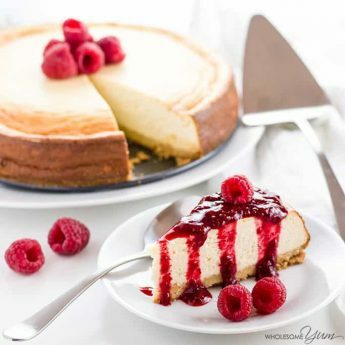 Welcome and I hope you find many recipes you like! Hi Diane, You can, but they will be more dense. You may want to add more baking powder to compensate. If you decide to try it, the replacement would be 3 large egg whites instead of the 2 large eggs. Hi – since Paleo is dairy-free, I’d like to avoid using butter. How different are the results if you use coconut oil? How much does it change the texture & taste? Hi Carolyn, Butter is one of those things that is up for debate in paleo circles. Many people do include it in a paleo diet, but you can also use ghee or coconut oil in this recipe if you want to. I prefer the flavor of butter or ghee, but coconut oil works, too. The texture is about the same either way. The flavor is a little different with coconut oil, but still good. Hi, Can you add sour cream to the batter and how much would you suggest? Hi Sally, I haven’t tried that. What is your goal with adding the sour cream? I’m sure you could. You’d probably need to replace some of the butter with sour cream in the same amount, to maintain consistency. *mixed with Splenda then seated in a puddle of sauce that I spiked with framboise and diced real cherries and then topped with whipped ricotta mixed with honey <—- awesome! *I added coconut milk and some flakes to the batter with coconut cream which were great alone but then I whipped the leftover coconut cream to put on top with some blueberries. Amazing. I had a couple of coconuts biscuits left over so I cubed and toasted them, mixed them with chopped pecans, walnuts and hazelnuts to make a little granola-like topping for a chocolate mousse made with ricotta and cocoa. Paleo purists could use it on an almond milk-based ice cream. The difference in texture is nice. Hope that helps. Thanks for the recipe. I've obviously used it a lot! All of those different ideas sound delicious! I’m glad you’ve been inspired by this recipe! I followed the recipe. I measured the butter while solid and then melted it. It turned out looking like the picture shown above. However, the biscuits taste more like dry cornbread than a biscuit. I made it a second time and added 2 tbsp of almond milk. The milk made the biscuit a bit softer, but it still tasted like cornbread. Although this recipe was really easy to put together, I don’t think I will be making this again. Thank you for the feedback, Liyah. Sorry that they weren’t for you. I hope you’ll try another recipe! Low carb bagels may be a better option if you’re looking for something more chewy. I made these and added garlic, old bay, and cheddar. Sooo goood!!! Thank you, Denise! Those add-ins sound great! I paired these (delicious!) biscuits with white cheddar and now I want to make another batch and bake the cheddar in. How much did you use and did you alter any other the other ingredients? Thank you! I have made these and added different kinds of cheeses, but my favorite is using Splenda and cinnamon in the batter! Thanks for the recipe, it is great. Thank you, Faye! I need to try a sweet cinnamon version of these. But you don’t say how many biscuits the recipe makes. Hi Kelly, This info is on the recipe card – it makes 12 biscuits. Would these be good for biscuits and gravy? Hi Amanda, Absolutely! Give them a try! I don’t see salt and pepper in these ingredients. You don’t seem to be counting the eggs, which are an ingredient. Yeah, please let us know, Sharon! These came out wonderful. I used them for strawberry shortcake. Broke up a biscuit in a bowl, added sliced fresh strawberries and put a little whipped, heavy cream on top. Nice to feel like you are having a treat but keeping the carbs low. Thank you, Mary! That sounds like an awesome way to enjoy these. What I have says Almond Flour/Meal. It reminds me more of cornmeal than flour. Could I put it in a food processor and it work for the biscuits? Hi Renae, A label like that usually means it’s almond meal, which is less finely ground than almond flour and typically not blanched. Putting it in a food processor would help (but be careful not to overprocess or you’ll end up with almond butter). Either way, the biscuits do work with almond meal, but the texture is a bit different. Thanks for sharing. I really need to keep my carbs down and eat no wheat at all. What country are you in? When you say biscuit, do you mean cookie? Or whatever the word biscuit means in America, I think like a scone or shortcake. Hi Sarah, I’m in the United States. Here, biscuits are more like a soft, buttery bread. The texture is a little similar to a scone, but they are savory, not sweet. They make a good accompaniment to a meal, or if you make a flattened version of these biscuits, you can use them as sandwich bread as well. Thank you, Christa! You could keep them on the counter for a day or two, but they are best stored in the refrigerator. My husband and I are doing low carb diet and I just made these! So easy and pretty tasty! I love that they’re GF for the kids too. We’re not allergic, just do better without it. Hi Amanda, I’m glad your family liked these! We’re the same way – not allergic to gluten but still feel better without it. Mine did not turn out looking like this. I have brown globs on my baking sheet. I probably don’t have fine enough flour. I haven’t tasted them yet. Hi Julie, Almond flour is finely milled and blanched – it shouldn’t be brown. Did you by chance use almond meal instead? That would explain the darker color. It might also work, but the appearance and texture would definitely be different. In general, I’d recommend almond flour over almond meal for this recipe. OMG! These were awesome, thank you!!! First “bread” since starting keto two weeks ago. Do you add the butter melted, cold and diced, or softened? Hi Lindsey, Measure the butter solid, then melt it and add it melted. Just made them with coconut oil! They’re super tasty for only 4 ingredients – thanks!! What can I use in place of the eggs? Can’t have eggs. Hi Sharon, I haven’t tried it, but flax eggs might work. Stir together 2 tablespoons of flax seed meal with 6 tablespoons water, and refrigerate for 15 minutes. Then you should be able to use the mixture to replace the 2 eggs in the recipe. Let me know if it works! These came out absolutely incredible! Cant believe they are paleo– they taste just like regular biscuits! Will definitely be making them again soon! What is the serving size for the nutritional chart? Great recipe! And sooo easy! I added Italian seasoning to my biscuits and they were yummy! Thank you, April! I love Italian seasoning, too. Can’t wait to make these too!! I’m really really loving your site! Hi! These look great. Would you consider making a coconut flour biscuit as well (if you don’t already)? I am less of a fan of almond flour and sometimes feel a little queasy eating it. Hi Sean, I’ve added it to my list to create a recipe for coconut flour biscuits, too. Thank you for the feedback! 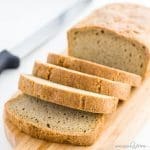 Would love coconut flour low carb bread! Thank you, Fannie! I’ll add that to my list. I do have a cauliflower bread made with coconut flour here. I’d like to make these sweet- with swerve. How much would you suggest? Hi Chris, The amount of Swerve required to make them sweet would likely make the dough too dry. You can try but I haven’t tested so not sure how it would turn out. I have a recipe for shortbread cookies with similar ingredients that you might want to try. Good Morning! I tried this recipe today and they came out really good. Thank you for sharing! These are SOOOOOO good! Thank you for sharing it!